Negotiations are a part of life. Whether you are a parent dealing with an aggressive toddler, or a business professional looking to seal the deal with a client, or a homeowner dealing with a settlement claim with your insurance company – you should learn to negotiate. But, negotiating is not easy. The art of negotiation escapes most of us because we don’t take the time to correctly understand how negotiating can benefit us. With this in mind, here are four practical tips that will help you successfully negotiate with your insurance company. 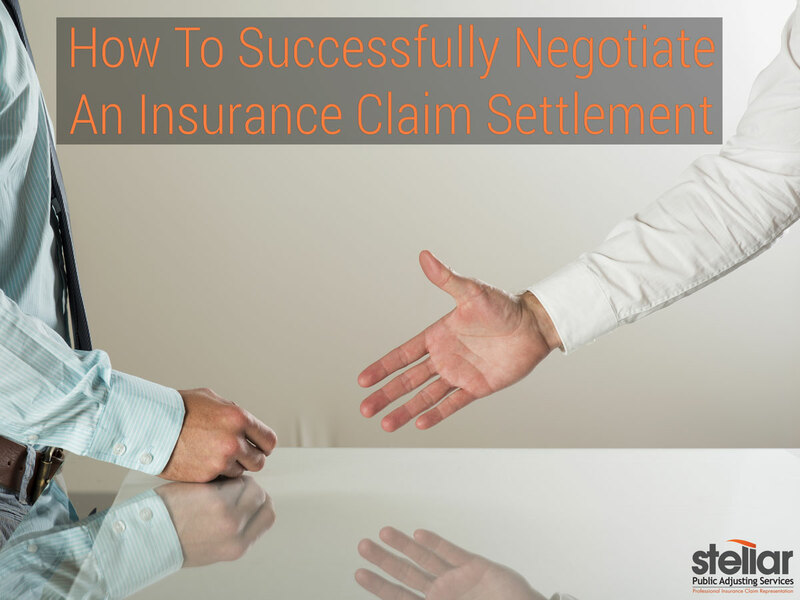 How to successfully negotiate an insurance claim settlement. The insurance company is issuing payment based on their evaluation of the claim. The key word here is “their”. Remember, you don’t have to accept their offer and it is highly recommended that you bring in a professional to assess the damages and present the insurance company with YOUR representative’s opinion of the damages. Insurance companies are in the business of making money, just like any other business. They have someone looking out for their interests – and you need someone to look out for yours. 2. Contact a public adjuster. If you are dealing with damage or loss to your property and you need to file an insurance claim, a qualified public adjuster will be able to assist and direct you throughout the insurance claim process. A public adjuster will represent you in order to get the best possible settlement to fix your loss and damages. 3. Do not sign until you fully understand the settlement offer. You should not sign a final settlement or release of liability until you completely understand the details of your offer. To save time and money, insurance companies want their policyholders to settle quickly. Furthermore, insurance companies want to settle quickly so that they are free of liability if anything else were to happen as a result of the incident that initiated the claim. In the long run, it will benefit you tremendously if you take your time and make sure you are completely comfortable with your settlement before signing. 4. Keep a record of all contact with your insurance company. Just in case you wind up having to go to court with your insurance company. It definitely helps to have relevant evidence handy to help your case. You should keep detailed records of every interaction with your insurance company’s claims adjusters, or other insurance officials. Additionally, you should keep all emails and you should record conversations, if you are able to. Keep in mind that you are negotiating with the insurance company. With this knowledge at your disposal, you should recognize that there is leeway and room for argument with all insurance claims. However, utilizing the services of an independent insurance adjuster can be such a valuable asset for you when dealing with your insurance company. If you need to file an insurance claim, Stellar Adjusting in Miami, Florida can help! We have the knowledge and expertise to make sure that you are properly compensated for your damage or loss. Call us today at (305) 570-3519 for a free policy analysis and property inspection. Our team of professional insurance adjusters will ensure that your insurance claim settlement process goes smoothly and you are satisfied with the settlement.